Every morning, Bruno the farmer must bring his animals to the pasture. But where are the lambs, cows, chickens, pigs and cats hiding? Only the players who press the animal sounds buzzer, prick up their ears and recognize which animal sound it plays, will be able to find the animals quickly and lead them to the pasture. 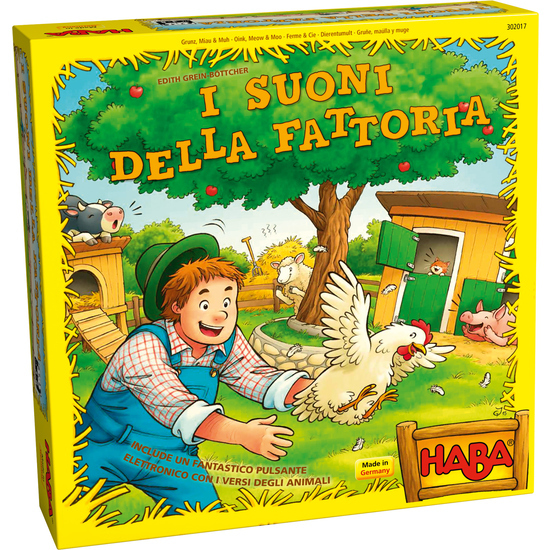 Contents: 1 board, 1 animal sounds buzzer, 1 farmer, 4 pasture cards, 25 animal tiles, 1 muck heap tile, 1 set of game instructions.